Franklin’s rite of fall is returning to Main Street Saturday, Oct. 24, with an all-day celebration that brings free and festive fun for a variety of ages and groups. 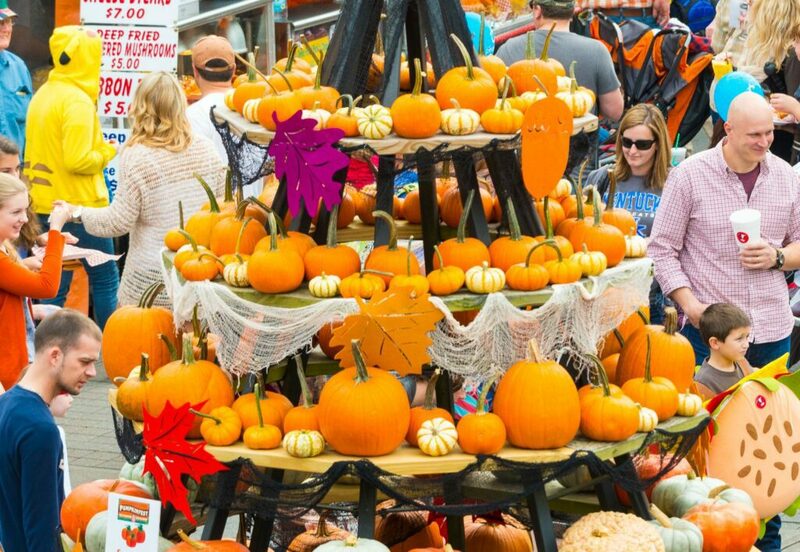 The 32nd Annual Pumpkinfest, held in the community’s historic core, attracts tens of thousands of visitors to downtown Franklin each year. Presented by Hyundai of Cool Springs and coordinated by the Heritage Foundation of Franklin & Williamson County, the festivities will stretch along Main Street and its connecting avenues from 10 a.m. to 6 p.m. on Saturday. In addition to the dozens of artisan vendors and two stages of live entertainment, attendees can expect to enjoy some of the festival’s favorite traditions for the 2015 event – including a costume contest sponsored by HomeTown Pet, the Church of the City’s Kids’ Zone and the Franklin Tomorrow Chili Cook Off. Plus, The Great Pumpkin will again be making an appearance after a long journey from Carleton Place, Canada (Franklin’s Sister City). Third Avenue South will be transformed with bouncy houses, pony rides, face painting, games, a dedicated preschool area and much more for the Church of the City Kids’ Zone from 10 a.m. – 3 p.m.
Two stages will feature full lineups of music and dance performances. In addition to the stage on the Public Square, a second stage will be located on Main Street at First Avenue, near Landmark Booksellers. The highlight of the afternoon is anticipated to be The ConSoulers, who will take the First Avenue stage at 4 p.m. for a two-hour street dance. Costume contests, sponsored by HomeTown Pet, will be held on the stage at the Public Square for both humans and pets. Nashville-based circus group Beyond Wings will perform Halloween-themed aerial arts on the corner of Second Avenue and Main. More than 80 independent artisan booths with handmade wares will line Main Street from Second to Fifth Avenue. Festival fare like corn dogs, funnel cakes, fried catfish and chicken tenders will join fresh offerings in two dedicated food zones: around the Public Square and on Fourth Avenue South. A beer tent will be located near the stage on First Avenue. The Franklin Tomorrow Chili Cook Off will take place on Third Avenue North. For more information, go to www.franklintomorrow.org. After dark, Franklin’s historic cemeteries will come to life with first-person stories of some of the folks buried there. For more information, go to www.franklinonfoot.com. In addition to parking in and around the downtown area, a parking and shuttle service for Pumpkinfest attendees will be available from Church of the City and Harlinsdale Farm for $1 per person each way. In addition to Pumpkinfest, the Heritage Foundation–in conjunction with the Downtown Franklin Association–produces seven event series and festivals each year to attract visitors to downtown Franklin, and to promote the benefits of historic preservation. For more information about the 32nd Annual Pumpkinfest and event details, go to www.historicfranklin.com/events. Since 1967 the non-profit group has been dedicated to protecting and preserving Williamson County’s historic, architectural and geographic resources; in short, saving the places that matter. For more information, call (615) 591-8500. www.historicfranklin.com.